The final day to see works by African-American artist Kara Walker at the University of Wyoming Art Museum is Saturday, May 14. 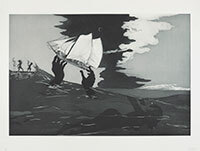 “Emancipating the Past: Kara Walker’s Tales of Slavery and Power” explores a range of approaches the artist has taken to subject matter, historical narrative, artistic media and technique, and the complexities and ambiguities of racial and historical representation. By highlighting the obscure references and old-fashioned techniques of Walker’s artistic process, which includes her signature cut-paper silhouettes, the exhibition aims to make her challenging approach accessible to a diverse audience. The retrospective of prints features works from the series “Emancipation” and “Harper’s Pictorial History of the Civil War,” as well as selected other prints, videos and a wall silhouette. The exhibition was curated by Jessi DiTillio, assistant curator at the Jordan Schnitzer Museum of Art, from the Portland, Ore.-based collections of Jordan D. Schnitzer and the Jordan Schnitzer Family Foundation. The exhibition is free and open to the public, courtesy of the Jordan Schnitzer Family Foundation. At age 14, Schnitzer bought his first work of art from his mother’s Portland, Ore., contemporary art gallery, evolving into his lifelong avocation as collector. He began collecting contemporary prints and multiples in earnest in 1988. The collection, which includes many of today’s most important contemporary artists, has grown to be one of the country’s largest private print collections. Schnitzer, who lends work from his collection to qualified institutions, has organized over 90 exhibitions at more than 72 museums. For more information about the Jordan Schnitzer Family Foundation, visit www.jordanschnitzer.org.